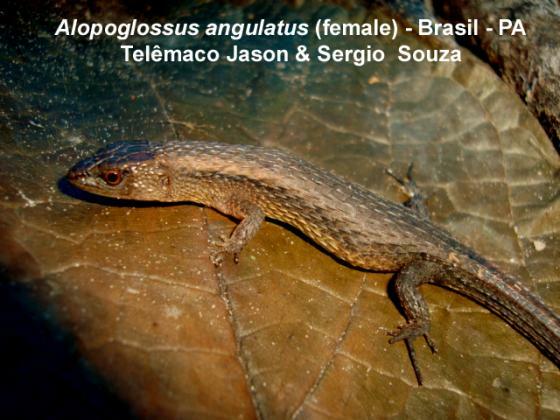 Can you confirm these amateur observations of Alopoglossus angulatus? Distribution Colombia (Amazonas), Brazil (Amapa, Para, Amazonas, Rondonia, Acre), French Guiana, Suriname, Guyana, Ecuador, Peru (Huánuco, Loreto, Madre de Díos,Ucuyali), N Bolivia (? ), elevation 100-760 m.
Diagnosis Diagnosis. Scales on sides of neck keeled, at least posterior ones leaf-like; gulars in oblique irregular rows (Fig. 3); scales on dorsum and flanks rhomboidal, strongly keeled and mucronate; ventrals usually smooth (rarely broadly keeled), posterior margin blunt or pointed [KÖHLER et al. 2012]. 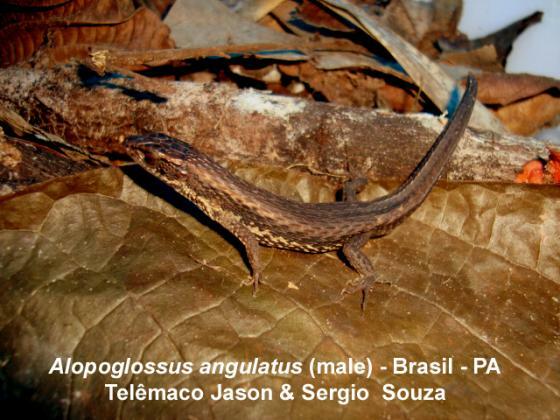 Comment Synonymy: Alopoglossus andeanus RUIBAL 1952 has been synonymized with A. angulatus by KÖHLER et al. 2012. The original diagnosis of A. angulatus, strictly combining scales of body strongly keeled and mucronate (except the ventrals and head scales), two large rounded scales under the throat, tail 1.5 times as long as the body and hexagonal in cross section, and colour brown, is evidently ambiguous (see Hoogmoed 1973: 223) and would include A. meloi and possibly other species (RIBEIRO-JÚNIOR 2018). Distribution: see maps in KÖHLER et al. 2012, RIBEIRO-JÚNIOR 2018: 33 (Fig. 5). Habitat: leaf litter of lowland tropical forest, often near water.